Bruno Ahrends born as Bruno Arons (April 9, 1878 – July 24, 1948) was a German architect. He grew up in a banker family in affluent circumstances. 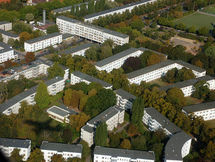 Ahrends studied architecture at the Technical University of Munich and the Technical College of Charlottenburg, Berlin. He originally wanted to study shipbuilding, but jews were not admitted to the Imperial shipyard in Kiel. After graduating in 1903 he worked as a clerk in the Public Building Administration and completed the second state exam to become government architect. In 1904 he changed his name to Ahrends, probably in connection with the fact that he and his siblings had converted to Christianity. In the same year he married Johanna Springer, granddaughter of the publisher Julius Springer. He left the public service and worked until 1935 as an independent architect in Berlin, until his disqualification because of his Jewish origin. In 1936 he fled to Italy, 1939 to Great Britain, where his daughter was living. There he was interned on the Isle of Man, because he had fought in the First World War against Great Britain. In 1948 he emigrated to Cape Town, where he died after his arrival. Besides country houses and villas, Ahrends planned and rebuilt numerous buildings. He also designed a number of local apartment buildings and settlements. The most famous among his designs is the "White City" in Charlottenburg, he was involved in the urban planning, with other well-known architects of the era. Many of his buildings are now under protection.